Our day at the Manila Ocean Park was well spent. Liz and I enjoyed looking at the colorful fishies and reading about their characteristics and such - and we even found Nemo! When we got to the end, we had a nice view of the Manila Bay and an option to either take a glass bottom boat ride or have our feet eaten nibbled by fish... at a Fish Spa! 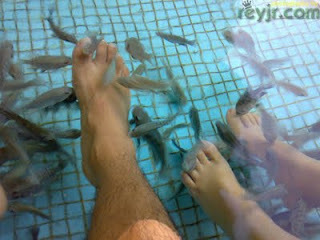 The small fish are called Doctor Fish. Oh, and if you're really ticklish, you should find someone or something to hold on to and prepare yourself to scream when you put your feet in the water. Haha! They tickle very VERY much. The Manila Ocean Park is a great hangout place, be it with your family, with your girlfriend / boyfriend or with a group of friends. They are open daily including Holidays from 10am to 6pm. Entrance costs Php400.00 - not bad really. You will definitely get your money's worth! anyway, i enjoyed the Dancing Jellies, 100feysus lang ang entrance. From my experience though, it wasn't at all "malansa" (what the heck is this in English?). Didn't get to see the dancing jellies - yun ba yung nag sasayaw sa ilalim ng tubig na mga babae?